Really great album with many favorites included, but the only minor problem is that this pressing has "Blue Öyster" on the vinyl label instead of "Blue Öyster Cult". Great pressing. Very quiet. Sounds fantastic. Very clean . . . I have this, but with an interesting misprint- the labels say it's the first BOC album, but I played it and it is indeed Spectres. Anyone else got this? 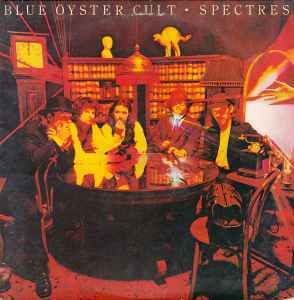 Spectres is the fifth studio album by Blue Öyster Cult, released in November 1977. The album was certified gold in January 1978 and contained the album rock hits "Godzilla", "Death Valley Nights", "R.U. Ready 2 Rock" and "I Love the Night". Do you sendo to Brasil?